Two baseball legends, broadcaster Vin Scully and manager Tommy Lasorda, begin their 50th year with the Dodgers this season. Both members of the Baseball Hall of Fame in Cooperstown, Scully has come to represent the tranquility of the game, while Lasorda mirrors its competitive side. Scully called himself a mere "observer." but his accounts of some Dodgers greatest moments have become as a soundtrack for the ages. Lasorda combined fun, motivation, comedy and strategy to fashion a career as a winner on the field and a bonvivant off. His office was a melting pot where Hollywood stars would mingle with players-and none would walk away hungry. Scully became interested in baseball when he listened to games on a furniture-sized radio in his living room. His favorite announcer was Red Barber, whose southern accent and homespun tales gave a distinct flavor to Brooklyn Dodger broadcasts. Following graduation from Fordham, Scully landed a job as back-up to his idol Barber, and learned not only more about his easy going style, but his ability to remain objective. Said Scully, "I was aware the first few times I heard my voice, it was better if I saw things with my eyes and not with my heart. I did not want emotion to color my facts." Although Barber left the Dodgers after the 1953 season, his influence remained as Scully developed into one of the premier broadcasters of his generation. Former Dodger Manager Buzzi Bavasi said, "Vin Scully taught people in Los Angeles about baseball. He was one of those rated as vitally important in making the Dodgers as popular as they are today." Scully was inducted into the ASA Hall of Fame in 1992. The Hall of Fame is located in the MCI Center’s National Sports Gallery in Washington, D.C.
Lasorda also came from humble beginnings. As a pitcher, he was never good enough to make it to the big leagues for any length of time, having appeared in only 26 games with Brooklyn and the Kansas City Athletics. After his brief pitching career ended, he became a scout in the Dodger organization and in 1965 received his first managerial assignment with the Dodgers rookie league team in Pocatello, Idaho. While Lasorda’s instructions were to groom talent, he could never change his attitude about winning. In his autobiography "The Artful Dodger," Lasorda said, "Telling me I didn’t have to win was like telling the Wright Brothers to take a train." Lasorda did win several minor league championships and developed future stars such as Steve Garvey, Ron Cey and Bill Buckner. He continued that success during his 20-year reign as manager of the Los Angeles Dodgers, bringing the city World Series titles in 1981 and 1988. Columnist Jim Murray summed it up best when he said, "What would baseball be without Tommy? A meal without wine. A day without sunshine A dance with your sister... Any cliche you want." Lasorda created many of baseball’s greatest moments on the field. Scully captures those moments from the broadcast booth. Together they represent a century of memories for the Dodger franchise and for baseball fans everywhere. 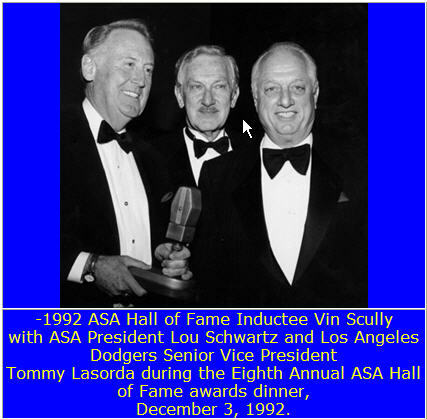 Lasorda served as Master of Ceremonies for the 1994 and 1995 ASA Hall of Fame Awards Dinners, during which time Keith Jackson and Chick Hearn were inducted into the Hall of Fame.